Alchemy Distillery released their first products (all unaged) in March of this year. So far they have been distilling a 100 percent mash bill of either wheat or rye. Their first two products were a clear Soft White Wheat whiskey and a clear Hard Red Wheat whiskey sourced from Hindley Ranch in Humboldt County. When they exhausted the local farmers' grain supplies (the grains are also used locally by bakers such as Beck's Bakery in Arcata) they sourced Organic Rye and other grains from just over the border in Oregon. Humboldt County is a lot closer to Oregon than it is to Napa/Sonoma, San Francisco or even the Interstate 5 corridor. Alchemy's fourth batch was an organic clear rye whiskey that is currently available. 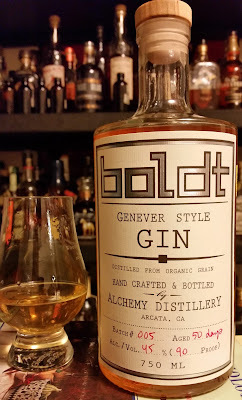 Prior to distilling that, they had crafted a gin using Buck Pronto Wheat from Oregon and put it away in a new charred oak barrel to make their Genever Style Gin. Fifty days later and the gin was ready to be pulled from barrel, cut to proof and bottled. They so far have bottled all their spirits at 90 proof. I really enjoyed the full proof gin and thought it had a real warm character, piles of cinnamon, star anise, clove, curry, pepper, smoke and baking spice. Cutting it down to 90 proof dampened the warmer spices and cinnamon, but brought out more of the gin-like juniper and added more citrus notes. The nose if full of floral, citrus and warm spices. It tastes of baking and pepper spice, green notes (juniper and redwood), and more citrus (primarily lemon, but also some orange and grapefruit). The finish is fairly long, with black pepper and lemon citrus notes. 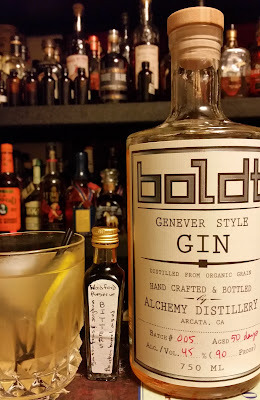 I made a couple of cocktails to try and bring out some of the unique flavors and meld the other ingredients to this warmer style of gin. The gin isn't as bright and astringent as a London Dry Gin so for a Gin and Tonic I used lemon instead of lime and put a dash of Woodford Reserve barrel aged bitters in. The spice and structure in the bitters complimented the cocktail well and brought the whole thing together. 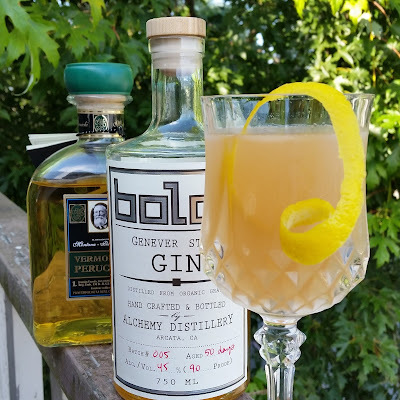 The next cocktail (and one of my favorites in a long time) is a modified and less sweet version of a classic gin based cocktail. Shake, strain and pour into a coupe or cocktail glass. Garnish with a long lemon twist. Make sure your lemon twist whisker curls nicely out of the glass. 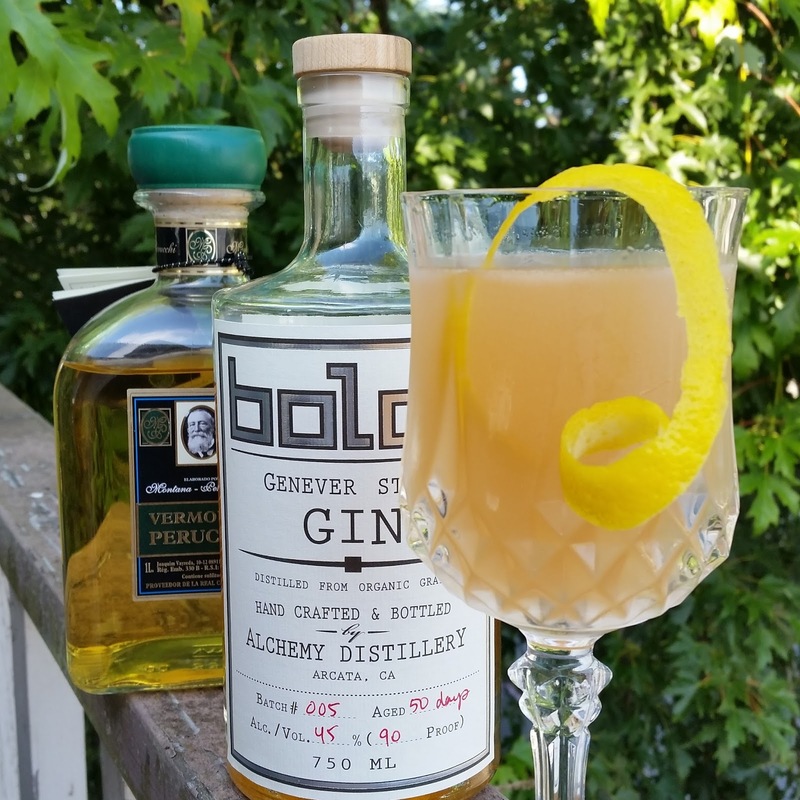 The warm, spicy qualities of the gin mix well with the aromatic complexity of the vermouth and bitters, and are buoyed by the brightness of the lemon juice and rounded character of the agave syrup. Be careful when enjoying this one. It is deceptively easy to drink and contains about as much alcohol as your average manhattan. If you are nearby and can try this gin, I highly recommend it. 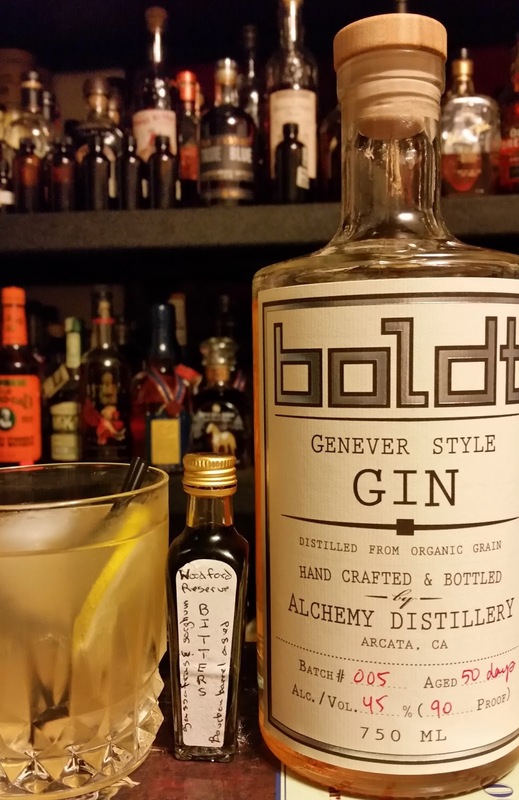 If you can't make it to the land of the redwoods, then grab a Genever Gin near you and try it out in some warmer, spicier cocktails.